I posted about Talking Tom Cat app supported by all Nokia Phones, 1 year back. Now, It is time for the newest and official version of Talking Tom released by Outbrain technologies for Symbian Belle devices. It is one of the most popular app ever released in mobile industry. 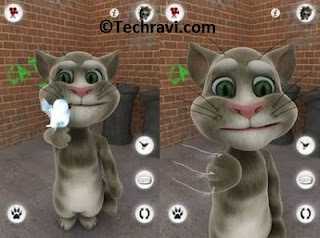 This Talking tom cat app is for Nokia N8, C7, E6, E7, C6-01 and other symbian Belle based devices. This app will not be supported by s60v5, s60v3 devices.